The Private Collection is a striking suite of five perfume pairs that celebrate the extraordinary moments of a life’s work brought to vivid, fragrant life. The collection introduces nine completely new fragrances sitting across the fruity, fougere, woody, oriental, chypre and floral led fragrance families. 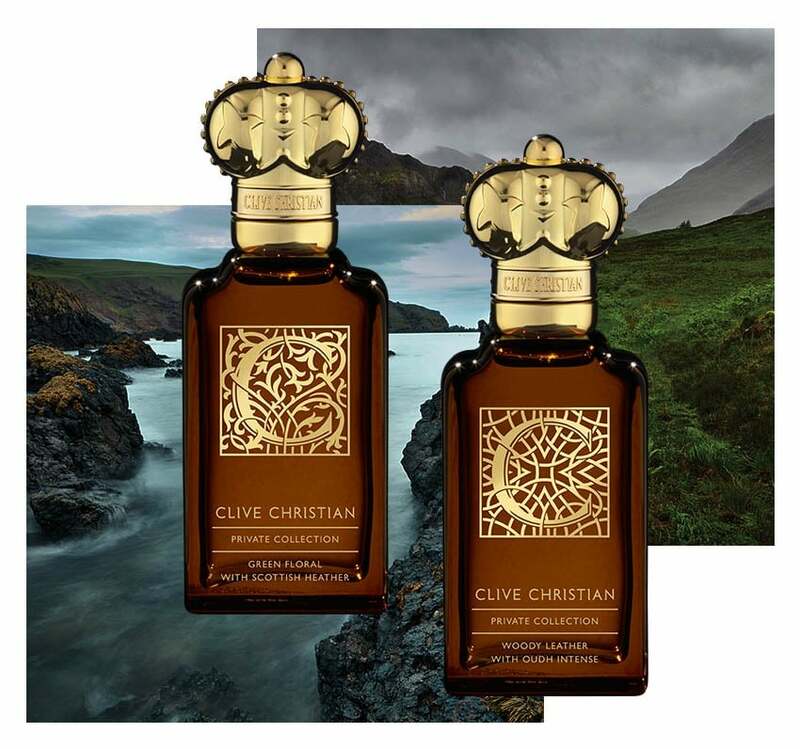 "C is Inspired by the rugged coastal landscape and wide-open spaces"
A perfume with an awesome power of immediate evocation; transporting you to the place of Clive Christian’s birthplace, recalling the majesty of the Scottish wilderness. A deep woody Oriental that imparts a seductive smokiness onto the skin enhanced by a fusion of its base and top notes, Tobacco and Saffron. Mandarin lends an immediate freshness that adds an uplifting balance. 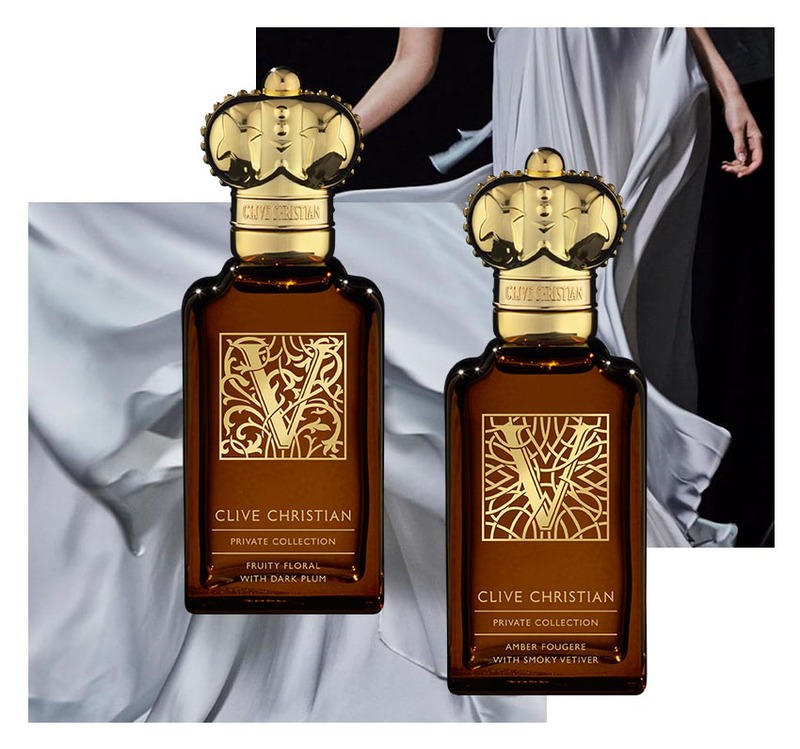 C Woody Leather has been designed as a pair to be worn with C Green Floral but the leather notes of the perfume also perfectly complement the spice and woods in V Amber Fougere and L Woody Oriental. Evoking the beauty of the Scottish landscape, the perfume explores the fragrant facets of the Scottish highlands. Featuring fruity green notes of apple, pear and chamomile, the perfume is given a fresh twist with crushed green grass and touches of fresh dew. A bouquet of roses is at the heart of C Green Floral supported by luxurious orris and fresh violet and woody heathery notes. The fusion of sandalwood, amber and smooth musk add a sensual accord to finish this fragrance. Designed to be worn as a pair with C Woody Leather but also when worn with 1872 Feminine, Noble VII Cosmos Flower and Noble VIII Magnolia can improve the rose accord across all of these perfumes. 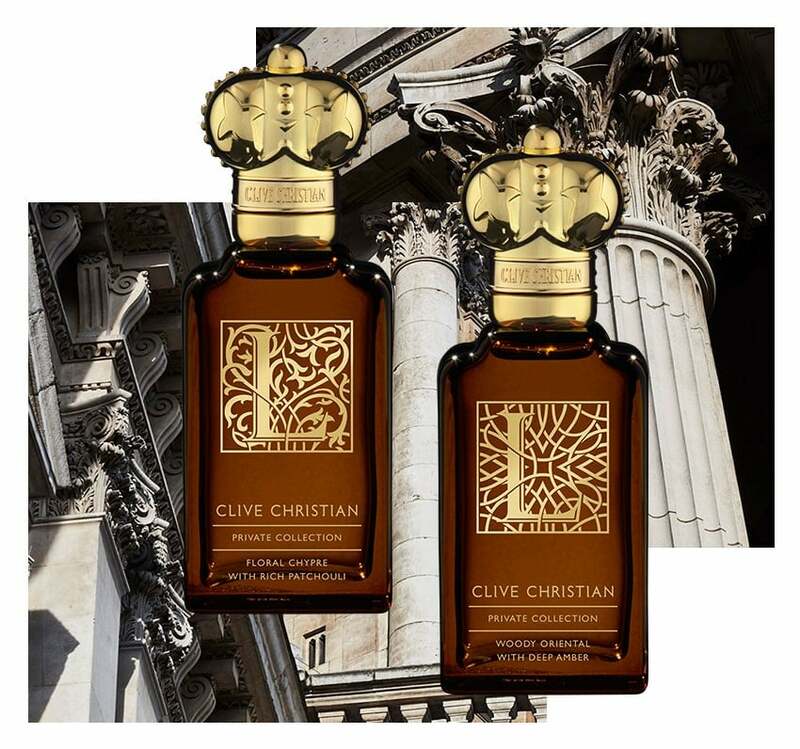 L is Inspired by London and it's architectural design"
Captivating and entrancing with its unexpected vivacity and surprising blend of woody and deep amber notes. The top notes of L Woody Oriental are bright lemon and mandarin with a peppery kick, whilst the heart introduces a warm clean aspect of lavender and geranium alongside fresh magnolia with sensual jasmine and creamy orris. A multitude of amber notes are complemented with tabacco touches, sweet musks and maple syrup whilst cade gives a smoky seduction to the base. Designed to be worn as a pair with L Floral Chypre, it also adds sensuality to Noble VII Rock Rose and 1872 Masculine. 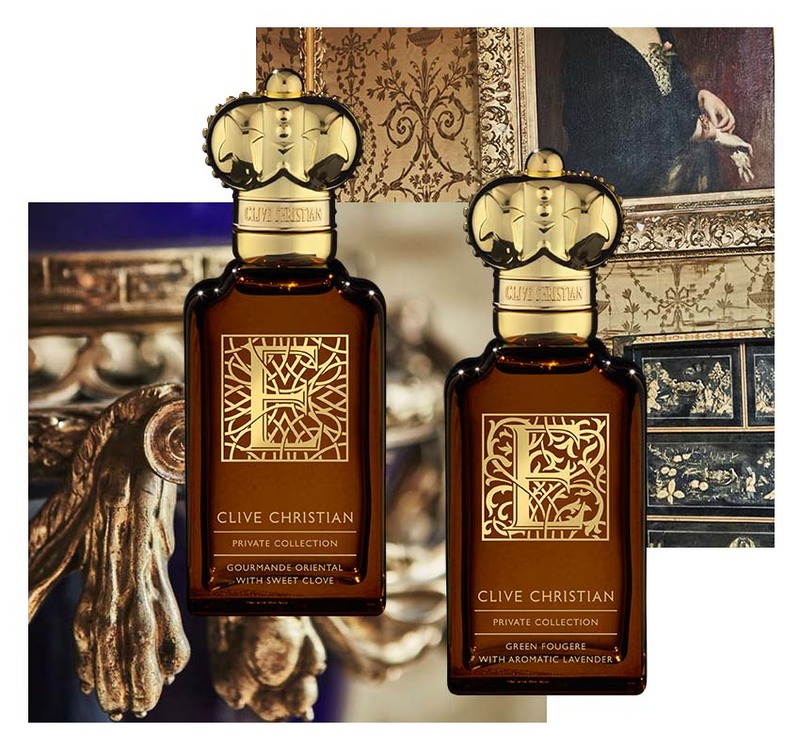 This perfume recalls memories of the secret and magical gardens, revered by Clive Christian for their evocation of pure natural beauty. From esteemed edifices to its pockets of treasured open spaces, this perfume hypnotises with jasmine sambac and rose shrouded in a rich patchouli base. Built around a rose and jasmine sambac heart, L Floral Chypre has been given an unusual twist with a dry orris accord and dry peppery frankincense. The fragrance opens with sparkling pink pepper, crisp rhubarb and a touch of peach for a modern feminine touch. The floral heart is given depth with a touch of exotic ylang ylang, warm spices and woodland amber notes. L Floral Chypre was designed to be worn as a pair with L Woody Oriental but also gives a sophisticated twist to Noble VII Rock Rose and X Feminine Edition. "V is inspired by movement and expression"
Wearing a great perfume is a kind of movement, you are seductively drawn in, scene by scene, note by note. V Amber Fougere is about movement, it has energy and passion. A rich combination of peppery notes combine to give the main character to this fragrance – pink pepper, black pepper, white pepper, frankincense and elemi. Wrapped around these peppery notes are bright bergamot and fir balsam for sweetness and aromatic richness. Lavender, cedarwood and orris combine to add a smooth sensuality to the fragrance, whilst vetiver and amber adds depth and warmth. V Amber Fougere was designed to be worn as a pair with V Fruity Floral and adds a lovely fiery peppery hit. A perfume that is an olfactory dance for the senses, it reveals itself to the wearer with the rhythm and lyricism of a beautifully choreographed ballet. With a fresh clean jasmine note at its heart this fragrance enlivens with its top notes of cassis and palmarosa. Subtle nuances of daphne and muguet keep the heart of the fragrance light and clean before richer notes of dark plum and ylang ylang spiral into the woody base rich with resinous tones of cedarwood fused with dark patchouli, rich ambers and suede. V Fruity Floral was designed to be worn as a pair with V Amber Fougere and offers a discreet softness when worn together. It also freshens up Noble VII Rock Rose and adds a fruity twist to Noble VIII Magnolia.